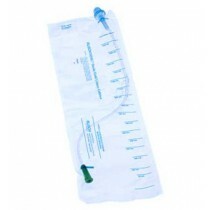 Rusch Touchless Closed Catheters are Intermittent Catheters designed to help prevent urinary tract infections. Clinically proven to reduce UTI urinary tract infections, the Rusch MMG Catheter Kit is a fully enclosed catheter within a sterile field. 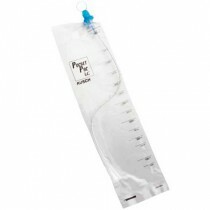 Protected from bacteria, the Intermittent Catheter is inserted with greater patient comfort and safety from infection. 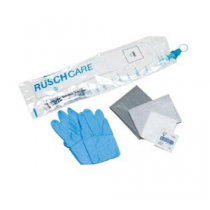 The Rusch Closed Catheter consists of a plastic catheter enclosed in a pre-lubricated plastic sleeve with a urethral introducer tip that protects the catheter from contamination by the first 1.5 cm of urethra which is colonized by bacteria. The Rusch Closed Touchless Catheter advantage is the Sterile Introducer Tip. The Sterile Introducer Tip provides for Intermittent Catherization using the Introducer Tip to bypass the colonized portion of the urthra; thereby, significantly reducing the risk of bladder infection. Load the pre-lubricated catheter into the Guardian Tip Introducer. Insert the Introducer into the urethra and pass the catheter into the bladder.